I planned the wedding whilst on maternity leave, which (funnily enough despite having a baby attached to me most of the time!) meant I had more time to plan than I would have had if I had been at work! I really enjoyed doing it, especially all the little creative touches like doing the stationery myself and designing my own shoes, and sourcing things from places like Etsy. Walking down the aisle and seeing Adam and Jimmy standing waiting for me at the end. I can’t believe I managed to hold it together!! I thought I would be, but I wasn’t. I was just so excited. I started to get a bit nervous when they kept me waiting outside in the boiling hot sun though… There was a delay in getting everyone seated so I had to wait about 15mins. Normally it’s the bride who keeps everyone waiting!! Mostly, yes. There were a few minor things that didn’t happen as planned but it was only me who would have noticed! Jimmy trying to eat our wedding rings! 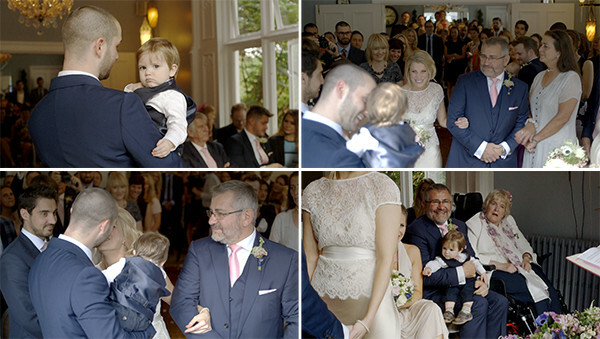 The best man helped him in his role as ring bearer, but he thought they be much better in his mouth… Our wedding cinematographer captured this fabulously on the video! Erm, we didn’t. But we should have done. Cringe. The focus was on family, so we wanted children to be invited, but we also wanted parents to be able to relax as much as possible, so we arranged a baby room for during the ceremony, staffed by nursery key workers and with entertainment by Jabberjacks. One of my work colleagues also made personalised biscuits that we put in guests’ rooms, together with a handwritten note to each of them. Adam bought me the most beautiful pair of sapphire earrings to wear on the day – very clever of him, as little did he know I’d be wearing navy shoes and had bought similar jewellery to go with the navy theme! Big thanks have to go to Nikki for all her hard work and numerous trial runs on the cakes, but also to her mum for making the corsage-sashes for the bridesmaid’s dresses! 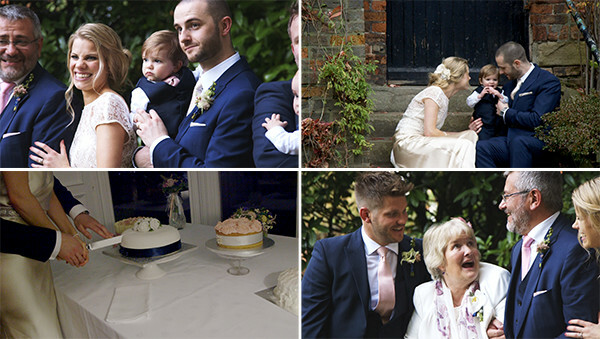 We were honoured to be Catherine and Adam’s wedding cinematographer. In fact I still can’t watch their wedding film without shedding a tear! Congratulations Mr and Mrs Shuttleworth!